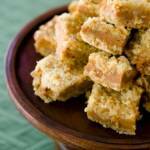 Brown butter lucuma bars taste exotic yet familiar at the same time. Bake the lucuma bars when you want to impress your foodie friends while still satisfying those with less adventurous palates. Melt butter in a small cast iron skillet or heavy bottom pot on medium-heat. Continue cooking butter, stirring periodically, until it browns - about ten minutes. Remove browned butter from heat. In a medium-sized mixing bowl, mix sugar, flour, oats, and baking powder. Mix in the browned butter. It's OK if the butter is still hot (just make sure that your bowl can take the heat). Press a little more than half of the flour mixture into the bottom of a baking pan. While the crust is baking, combine lucuma, sweetened condensed milk, and eggs in a medium-sized bowl. When the crust is done, spread the lucuma mixture over the crust. Top with the remainder of the flour mixture. Bake 30-35 minutes or until set.